Founded in 2003, Hayes Scott Bonino Ellingson Guslani Simonson & Clause, LLP, has quickly become one of the most respected commercial litigation and appellate law firms in the state of California. Our California business law attorneys have also built a reputation for effectively handling legal matters ranging from new business formation to complex corporate litigation and class actions. Hayes Scott Bonino Ellingson Guslani Simonson & Clause, LLP, is a commercial litigation and appellate boutique. Our Silicon Valley based firm has a California statewide practice focused on representing corporate clients in complex commercial matters. Hayes Scott Bonino & Ellingson clients range from Fortune 500 companies to venture funded startups. The five founding partners started Hayes Scott Bonino & Ellingson in 2003, which has since grown to 22 attorneys. The firm's practice has consistently evolved with the needs of our clients to meet the challenges of today's dynamic business environment. Hayes Scott Bonino Ellingson Guslani Simonson & Clause, LLP provides counseling and representation for its clients in complex commercial litigation and transactions. 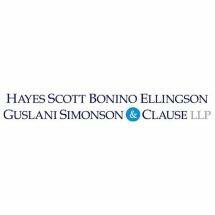 Hayes Scott Bonino Ellingson Guslani Simonson & Clause, LLP clients retain the firm to protect their intellectual property rights in diverse matters involving trademark, trade secret, copyright and licensing in the transactional and litigation settings.